Nice! 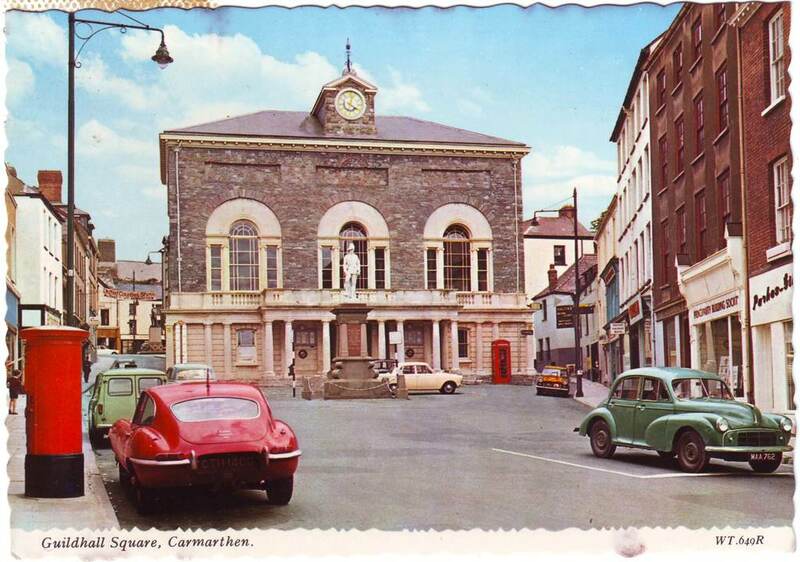 When I first saw this postcard I wondered whether this super sleek Jaguar was owned by a local Carmarthen business person or whether it was someone down from London, or some-such place, on holiday? In fact it is a local car, as the registration number CTH140C tells us it was issued by Swansea licensing office. Seeing the postcard also brought back memories of when, as a child, my father took me to Cardiff docks in the late sixties to see row after row of left hand drive E-Types waiting to be exported. There seemed to be hundreds of them. Wish we had taken some photos. I’m adding this comment to the post because it is too good to me missed in a hidden comment box. Hi, This is fabulous. we purchased CTH 140C 5 years ago. It came from a car collection in Essex. It certainly is a Welsh car. I have the original Green log book from 1965. The first owner was Mr Jones and he sold it to another Mr Jones. My Wife Jacqueline is officially the registered keeper and is the 6th owner. From the MoT records it seems to have done just under 67000 miles from new (between 1985 and when we purchased her, she’d only covered 1900 miles! I can certainly scan a photo and send a picture to you. If we could have the postcard I would be happy to make a donation to your favourite charity. Could you e-mail me at XXXXXX or call me on XXXXXX and let me know how to organise this. Thanks. Neil W.